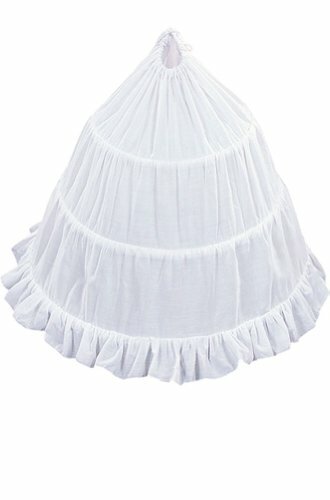 AMJ Dresses Inc Girls 3-hoop Flower Girl Petticoat Skirt 30"
The Main Material of the Slip Is Cotton. It Also Has a Drawstring Waist. The Hoops Are Made of Very Thin Coated Metal Which Are Removable and Can Be Easily Adjusted to Decrease or Increase the Fullness of the Slip. The Hoops Are Very Flexible and the Slip Is Easily to Be Looped and Folded Into a Bag for Conveniently Carry Around. Absolutely Gorgeous! The Main Material of the Slip Is Cotton. It Also Has a Drawstring Waist. The Hoops Are Made of Very Thin Coated Metal Which Are Removable and Can Be Easily Adjusted to Decrease or Increase the Fullness of the Slip. The Hoops Are Very Flexible and the Slip Is Easily to Be Looped and Folded Into a Bag for Conveniently Carry Around. If you have any questions about this product by AMJ Dresses Inc, contact us by completing and submitting the form below. If you are looking for a specif part number, please include it with your message.